The challenge of filling the SME funding gap has become much tougher. It was in late November last year that we broke the exciting news that alternative business funders had channeled so large an amount of funding into UK SMEs that the quarterly drop-off in lending under the Funding for Lending Scheme (FLS) had been negated. The FLS was designed to incentivize banks and building societies (traditional lenders) to lend to the nation’s small businesses. Net lending under the scheme took a £128m dive in Q3 last year. But in that same time span, alternative lending platforms supplied £268m to the UK’s small businesses. In other words, not only was the small business funding gap closed, an extra £140m in fresh SME funding was conjured up. The Q4 2014 data paints a less rosy picture. 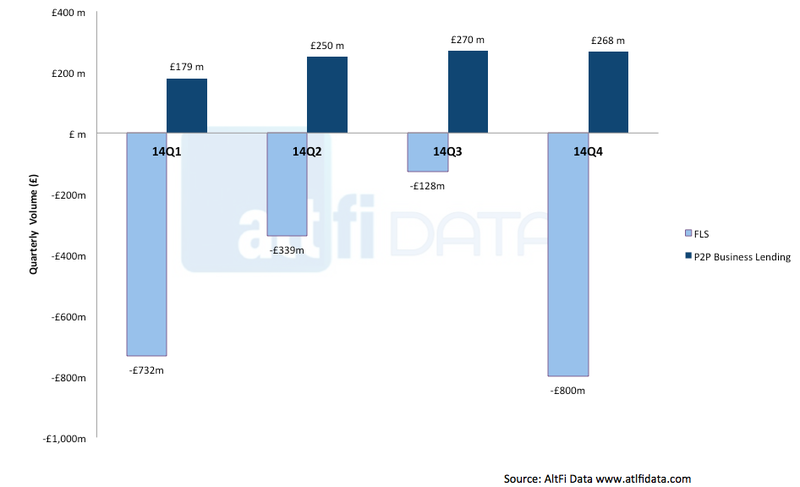 The alternative business lenders tracked by AltFi Data (comprised of peer-to-business lenders and online invoice financiers) put up an eerily similar, equally impressive £267.6m of funding. All the more impressive given an inevitable Christmas lull in activity. Not to mention the fact that we’re not including Zopa and RateSetter’s business lending activity, nor are we factoring in the contributions of a host of lenders that do not feature an online exchange (merchant cash advance providers, trade financiers, and the like). Unfortunately, however, not even the full gamut of alternative lenders would have been nearly enough to close shut the SME funding hole that opened up in Q4. Small business lending from traditional providers via the FLS fell by a staggering £800m in Q4 2014. Sadly that means that, in spite of the best efforts of alternative lenders, over 500m of small business funding disappeared over the final stages of 2014. "The latest figures show that the Funding Circle marketplace is the 6th largest net lender to small businesses in the UK. Despite best efforts, the Funding for Lending scheme is trying to rejuvenate a broken system which is restricted by legacy issues. The marketplace model on the other hand uses technology to connect supply directly with demand for a fraction of the cost. We are on the brink of the biggest financial services revolution ever - customers now have direct access to fast, fair and transparent finance." This story hammers home the fact that whilst the alternative finance may be flourishing – there remains a huge amount of room for growth. And the greatest accelerator of that growth will be increased awareness.